Hearthstone has made major waves since it was released earlier this year, introducing thousands of players to the genre, a genre created by Magic: The Gathering more than 20 years ago. 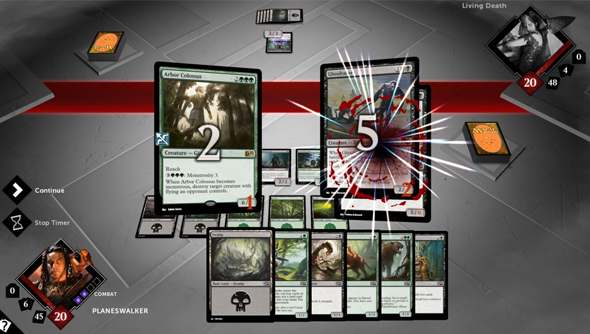 “Action TCGs are play on your own turn, you don’t interact on your opponent’s turn, as you do in Magic with instants,” Barrett said. In Magic turns are broken down into phases, your moves can be countered by your opponent, and you can try and counter those countermoves by playing cards that bestow an instant effect on your monsters, buffing its strength, for instance. When I met Cory Jones, Cryptozoic’s creative director and the main driving force behind Hex: Shards of Fate, a CCG with a ruleset that mirrors Magic: The Gatherings, he said that one of the advantages Hex had was it began as a digital game. “Restrictions breed creativity,” he says. “The fact that our cards are, for the most part, represented in paper means there are certain restrictions on what can and can’t be done with them. However, that means you can be creative with what you do in that medium. “One of the things the lead designers on Magic have said is that they will run out of themes for new cards, sets, and blocks before they run out of new ideas. When you see a new set of cards, which has got 150 new cards in it, to get to that 150 new cards they will have gone through several hundred more, or even thousands more ideas and iterations. There will be entire mechanics that have been set aside for potential future use. I’m not worried in any way that they’ll run out of ideas or the ability to create new cards. Basically, you’d have your double-backed card separate from your deck and your checklist card shuffled into the deck. When you drew that checklist card, if you met the play conditions of the double-backed card, then you could now play your fancy pants double-sided card. We’ll have our preview of Duels of the Planewalkers 2015 up soon. Hint: Wizards of the Coast have reason to be confident.